Come vacation on the white sands of Siesta Beach! 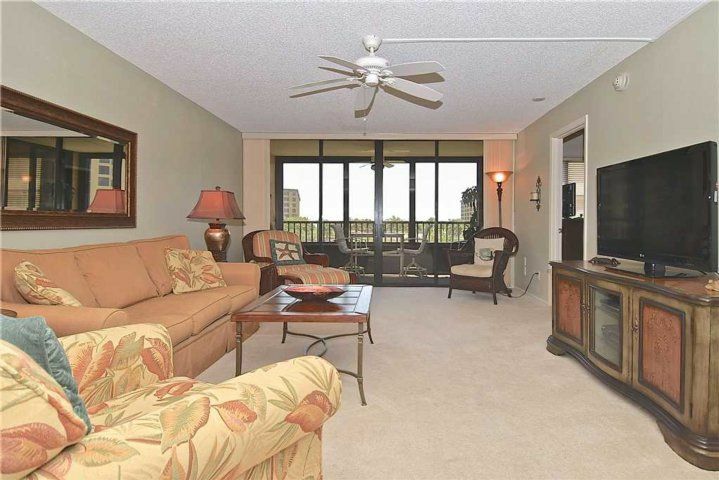 When you stay at our condo at Gulf and Bay Club 204C, you'll enjoy luxury and comfort in more than 1,500 sq ft of beachfront property, including a lovely lanai. And the use of resort amenities is included! 28-day minimum stay required. 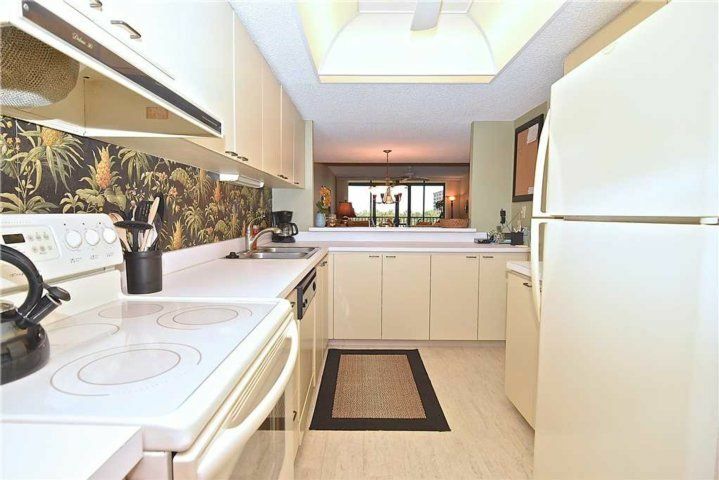 Gulf and Bay Club 204C is available for stays of one month or longer, which is almost enough time to appreciate all there is to see and do on Siesta Key! 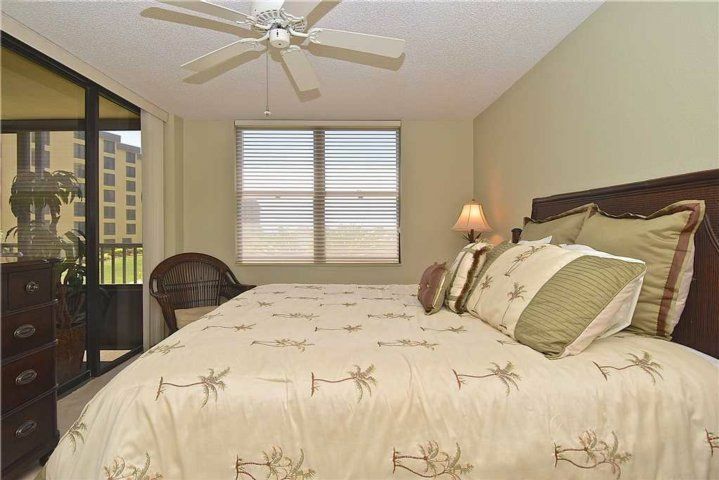 You'll settle right into our spacious, well-furnished condo, just steps from the beach. And at the resort complex, you have access to 3 swimming pools (1 lap, 2 heated for family splashing), 6 saunas, tennis and racquetball courts, shuffleboard, 2 libraries (with videos as well as books), and so much more! We have 24-hour on-site security here, no traffic, and views to die for. It's the perfect seasonal getaway for snowbirds and summer travelers alike! 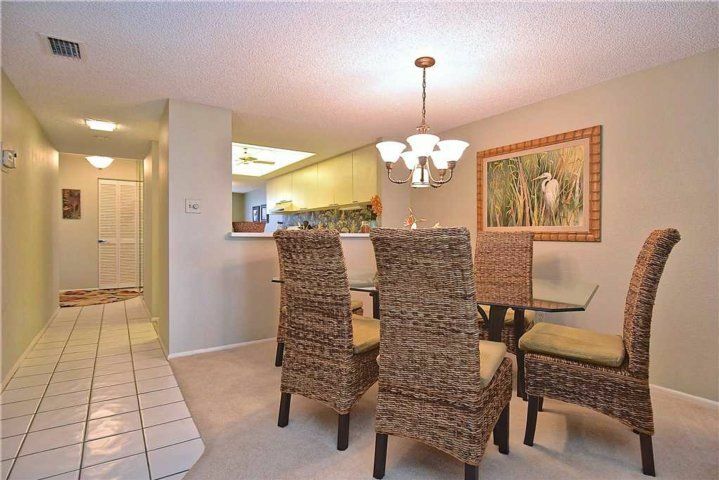 When you enter the condo, chances are you'll walk right out again -- onto the long 2nd-storey lanai, that is! 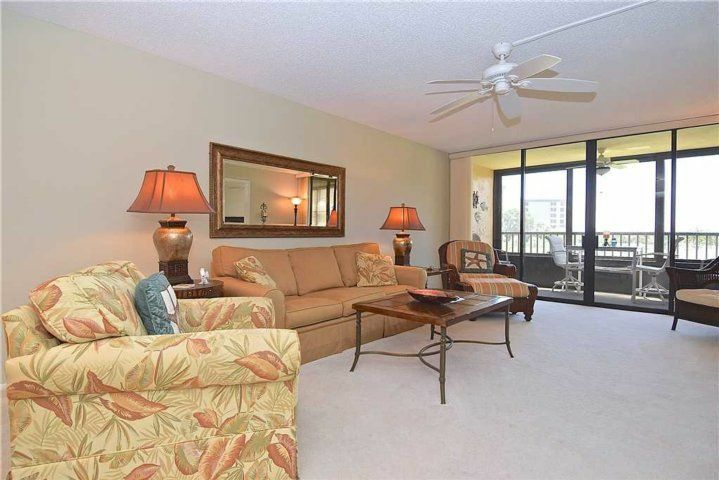 With breathtaking views of the ocean, beach, and resort, the lanai is a great place to sit at all hours. It's covered for protection from the hottest midday sun, with clear screens that let in the balmy breezes and sunlight. You'll find casual seating and dining furniture out here, so bring your morning coffee and evening wine out here and enjoy the sight of pelicans gliding past in a stately row, the murmur of the surf in the background. So relaxing, you may just have to dine al fresco, too! 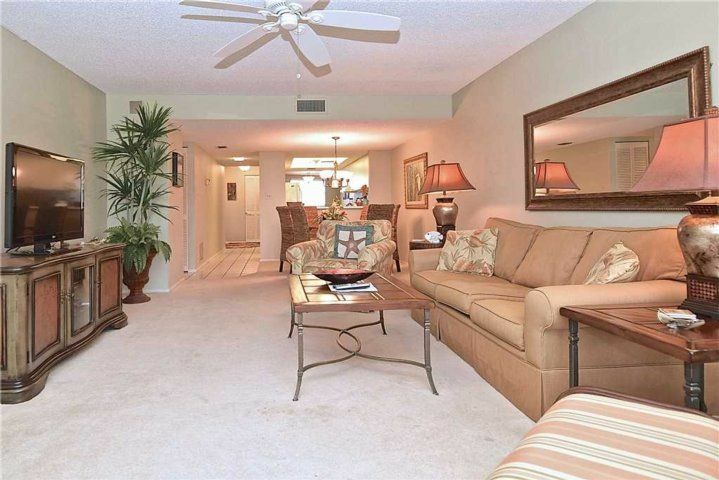 Step indoors and find yourself in the large, open living area of the condo. Warm golds and oranges add a tropical note to the Mediterranean styling of this room, and a brand-new flat-screen HDTV stands ready to entertain you, equipped with cable, VCR, and DVD player. The couch unfolds into a queen-sized bed for two, in case you have guests or the children want to have a sleepover and watch their movies all night long as a treat. Easy chairs and floor space abound in this room, so the whole group can gather with toys and projects and all the fun things we all bring to do on vacation. The dining table is adjacent to the living area, and makes a great place for your laptop (you have free WiFi here), board games (Trivial Pursuit, anyone? ), and puzzles. 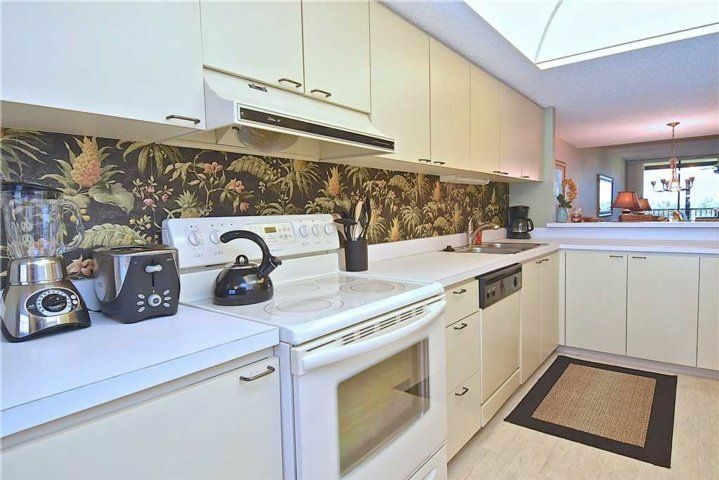 As for meals, most of those will wind up being served out on the lanai, but if you should dine indoors, the low counter in the kitchen makes a great serving hatch and buffet station. 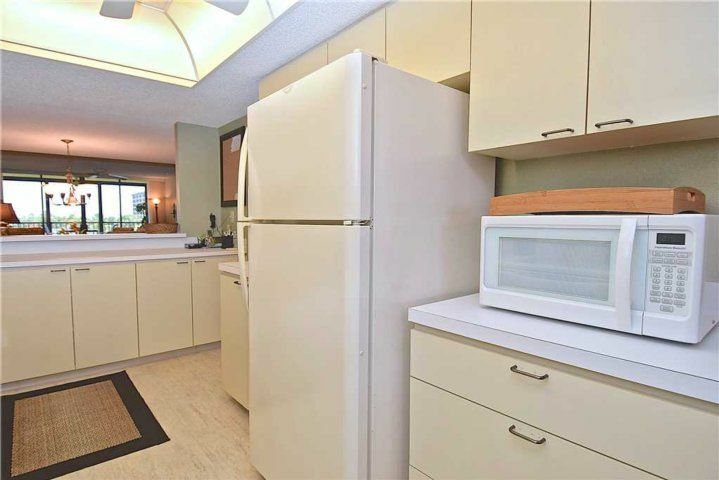 You'll appreciate how well stocked the kitchen is in this condo. You'll be staying a month or more, so you'll want to eat in at least some of the time. At Gulf and Bay Club 204C, all you need to get is groceries -- we've got every piece of cookware, utensil, glass, and dish you could ask for. 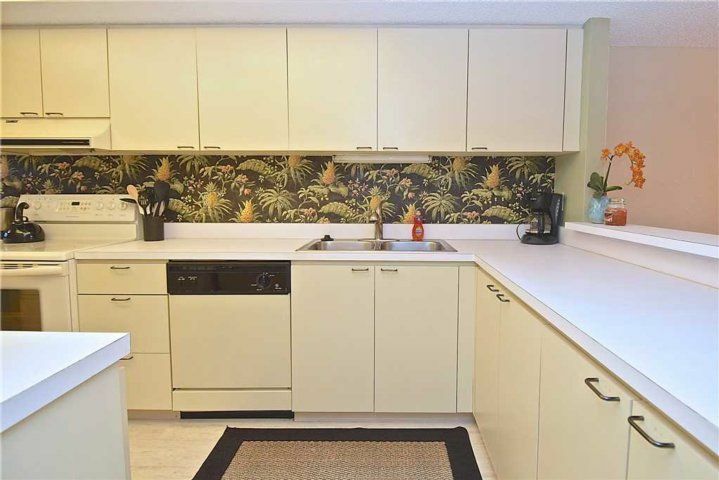 In 2010 we replaced all the appliances with state-of-the-art stainless steel models, and you'll love how fun the kitchen is to use! 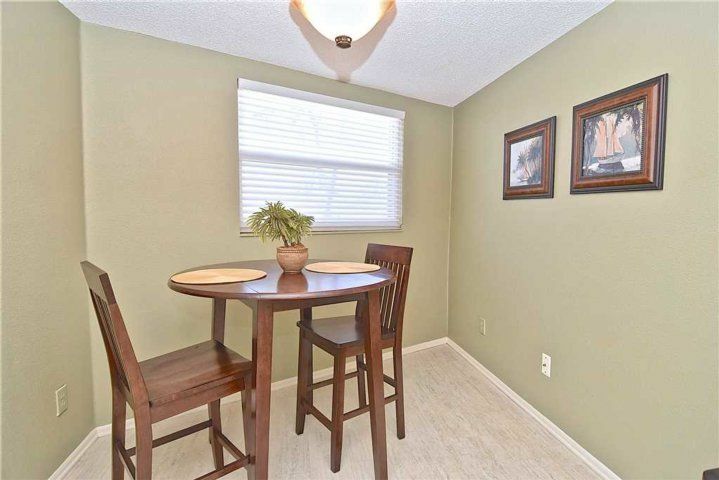 Tucked away in the far corner of the kitchen is one of the best parts of the condo: the breakfast nook! This small table sits beneath a sunny window, just perfect for a cozy chat, a quick postcard-writing session, or a dreamy mid-morning cup of coffee. When it's time to retire for the night, everyone will look forward to snuggling into their comfy beds. 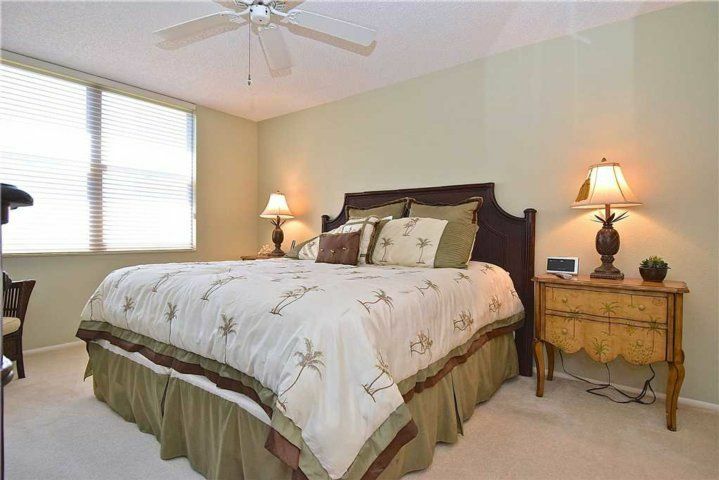 There are two bedrooms at the condo, plus the sleeper sofa. The master suite is definitely the star, with a king-sized bed, its own flat-screen TV, big windows to flood the room with moonlight or the morning sky, and an en-suite bath with both a shower and tub option. But the second bedroom is a pleasure as well: 2 twin-sized beds, a flat-screen in an alcove, plenty of storage and floor space, and easy access to the second full bath. 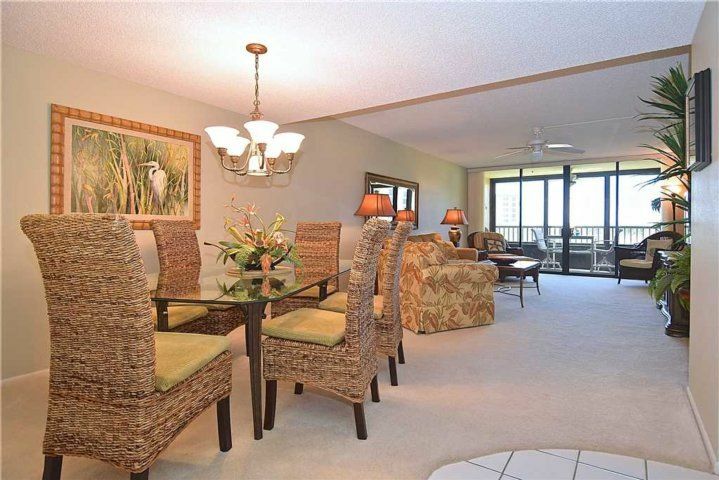 At Gulf and Bay Club 204C, you will find everything you need for comfort. 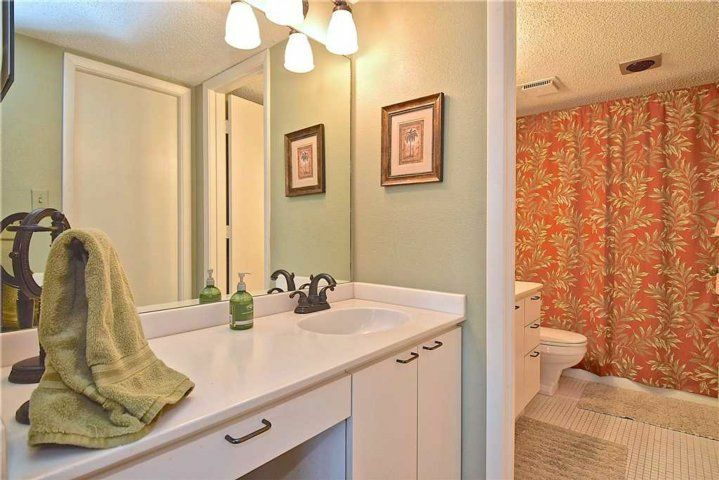 All linens and towels are provided, plus extras in the linen closet. Feel free to use our washer and dryer, so you can pack light. We also have all those extras of a family home, from an ironing board to beach toys. You're going to feel right at home here! Come stay in our Gulf Coast getaway very soon! The location of this unit is wonderful. We were within walking distance of everything. However, the unit and furnishings, while well equipped, are showing their age and needs some deep cleaning, repair and updating. The carpets and windows need to be cleaned. The toilet and AC need to be repaired. The linens need to be replaced. 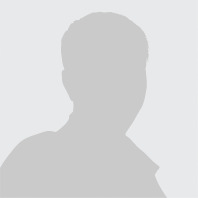 The laundry machines should be are very loud and should be repaired or replaced. The sofa sags in the middle and is uncomfortable.If these things were addressed we would rent the unit again, but as of now we are looking for a unit that is in better condition.